The garden is an ascetic counterpoint to the flamboyant building, a deliberate choice by Kiley who told former Dallas Morning News architecture critic David Dillon: “[W]e reined in our egos and played it pretty straight, not doing certain things so as to avoid making a separate work.”  The symmetrical plan is book-ended by paved plazas that each hold a black granite lined circular fountain with a single jet programmed to shoot water thirty-five feet high. 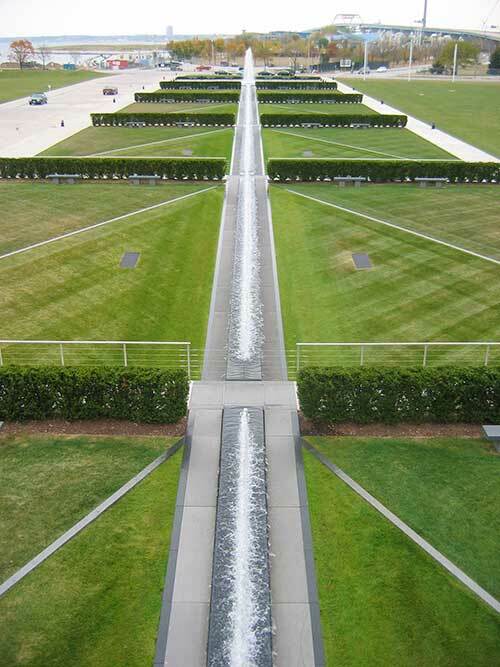 A three-foot-wide water channel runs the length of the site, dividing each of the hedges, and connects the two fountains. Water jets within the channel project water four feet high, creating a shimmering curtain of water that helps animate the space. The five center garden segments are lawn. On each side of the channel these lawn panels are split diagonally so that the portion of lawn abutting the channel slopes towards the runnel at a 5% incline. When seen from above these sloped sections appear as a series of arrows pointing away from the museum structure. This effect is reinforced by the use of two different types of grasses within the lawn, a finer one for the segments abutting the road and coarser one for the inclined segments. Low retaining walls at the base of the hedges allow them to sit on a level plane. Outside of this central garden area Kiley specified the installation of two bosques of trees – one with eighty-four dwarf Sargent crabapples that sits on the Lake Michigan side of Art Museum Drive along the central garden’s eastern edge; and the second, a bosque of lindens installed in 2002 to the north of the space. Arching out over the garden, a bridge projecting from the new building provides visitors an overhead view of Kiley’s design. The landscape’s future has occasionally come up for debate. 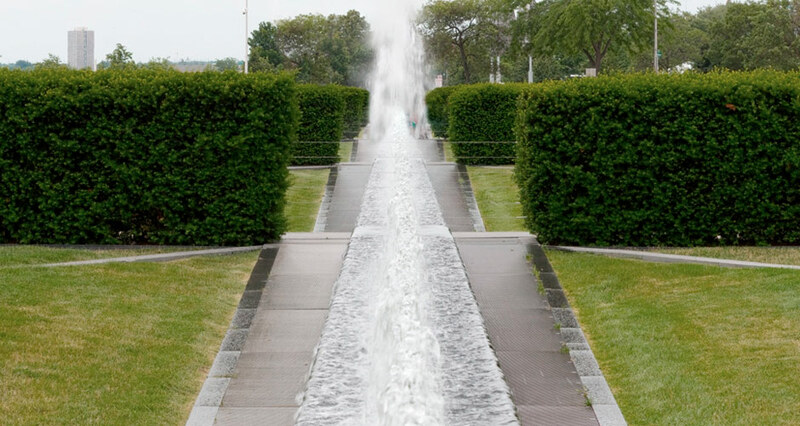 In 2006 Whitney Gould, then architecture critic for the Milwaukee Journal Sentinel, wrote she was “dismayed” when she heard the museum was, “thinking of tinkering with its Dan Kiley-designed formal gardens.”  To do so, she opined, would be, “akin to rewriting one of Bach’s fugues. Or giving the Mona Lisa a makeover.” Maintenance for the Cudahy Garden remains an issue, as it does with Caltrava’s Quadracci Pavilion. 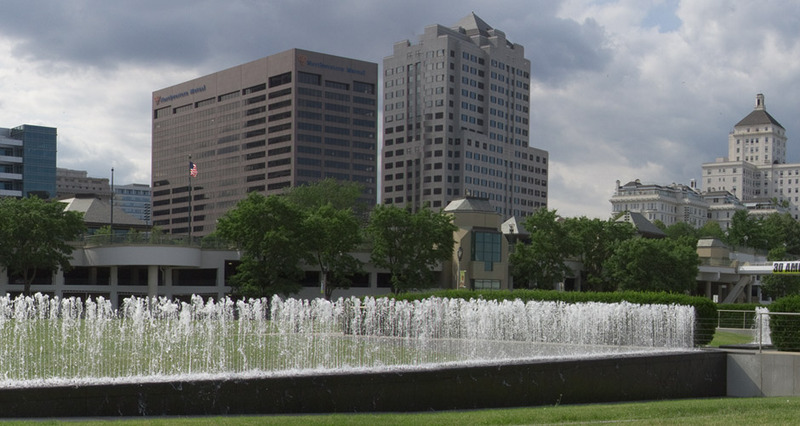 In 2013 grass along the central garden looked brown and dry, in contrast to that in neighboring parkland. 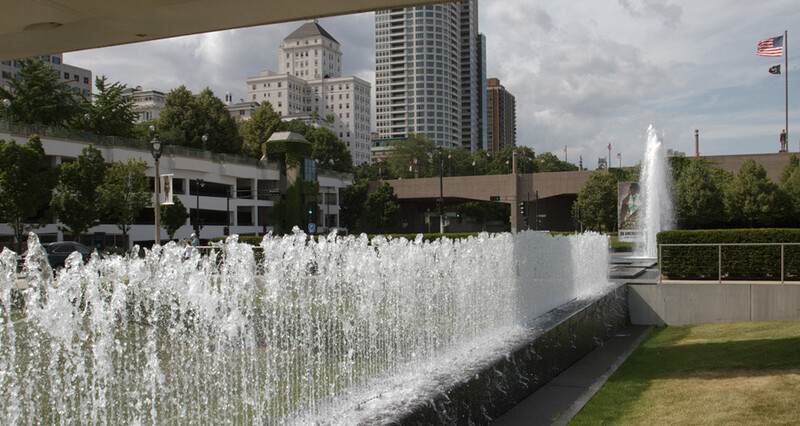 The night lighting for the central fountain is no longer functioning and the water jets are rarely set to the height that Kiley intended in his design. 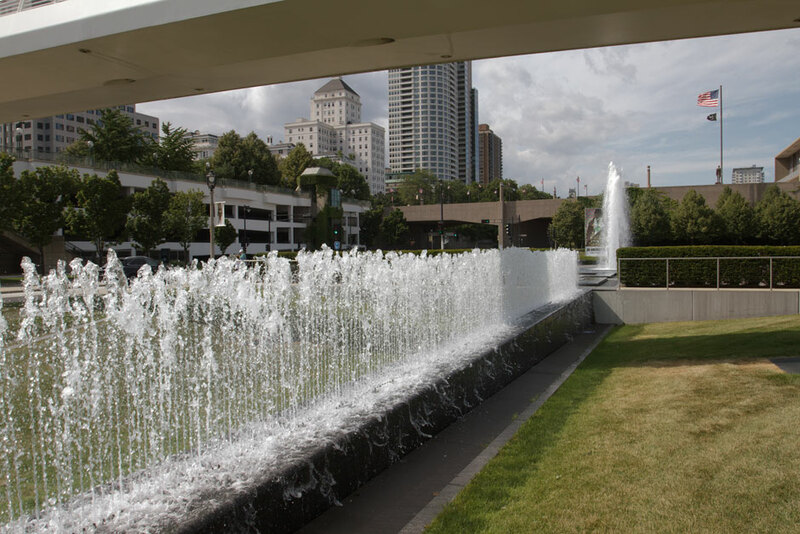 In addition, Kiley’s design itself has been altered by the planting of rose bushes within a lawn panel that abuts the southern side of the central garden. Good management and curatorial leadership could easily remedy these problems, and is the key for securing the future for the site. 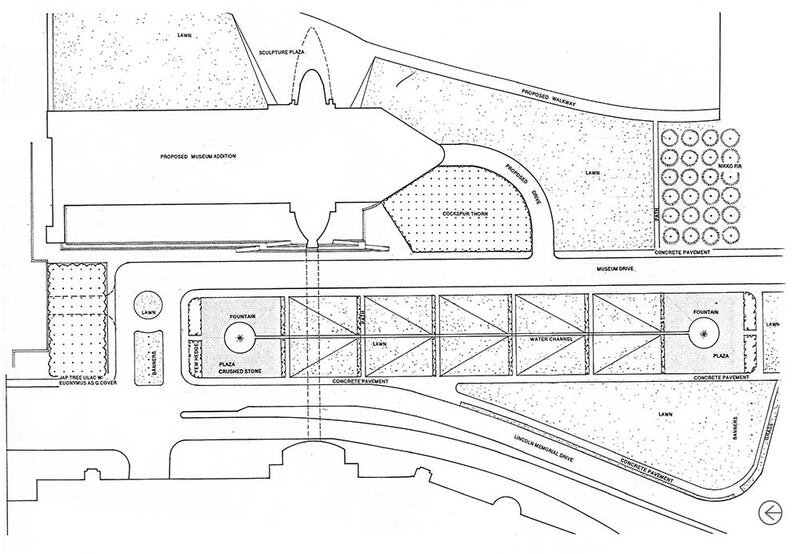 1 Dillon, David “Plain Geometry,” Landscape Architecture, March 2003, 57-58. 4 Gould, Whitney, “Tranquility remains in gardens,” Milwaukee Journal Sentinel, July 3, 2006. 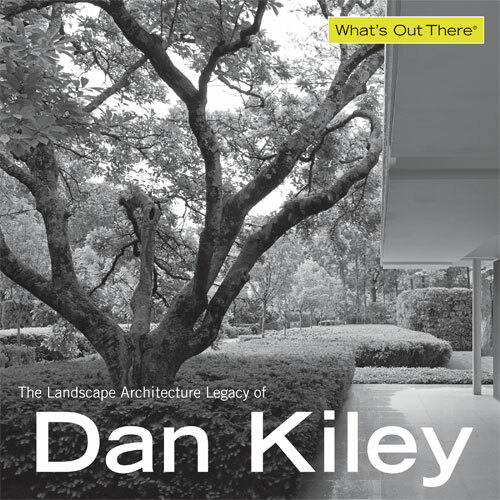 This was a unique and complex project and one of the last major commissions of Dan’s long and celebrated career. It was a remarkable experience for me working with Dan and Santiago Calatrava, seeing how these two great minds interacted. I remember sitting in the elegant lobby of the Pfister Hotel in Milwaukee with Dan and Santiago, a big sketch pad out on the table, both of them communicating with fat pens on the paper getting more and more excited with each line drawn. I remember lavish dinners with Martini’s (of course) and the time Dan decided to bring a “doggie bag” of Frutti di Mare from a restaurant in Milwaukee back to Vermont for his beloved dog, Dorcas. Upon returning to the office he placed his suitcase in the entry foyer and there it sat for several days until the olfactory receptors of the entire office were awoken. Anyone who knew Dan understood how much he loved to travel, entertain, impress and - most importantly - have fun. He had a masterful wit and a totally engaging presence. Michael Cudahy the eventual benefactor for the MAM garden flew to Vermont to meet Dan and to view a presentation of the proposed design for the project. Mr. Cudahy brought some excellent wines with him which were promptly opened – this was about 10:00 am… then the two Irishmen sat down and the resulting conversation was highly intelligent, energetic and totally amusing. The topic rapidly shifting from Ireland to golf to design and back again… animated and yet totally focused. It was a remarkable thing to witness the passion with which Dan described his designs. He was equally as talented at verbal communication as he was at design. Perhaps my fondest memory of Dan over the course of this project was at the opening ceremony in October 2001. Dan had been in failing health for much of the duration of the project, at times so weak and frail he could barely hold his own body weight. We were concerned that at 88 years old he may not be up to the evening’s festivities. We were completely wrong on this account. I still have a vivid picture in my mind of Dan, at midnight, on the dance floor doing what he referred to as the “Continental Rock”. He was an amazing man. Milwaukee Art Museum. “Museum Info: Cudahy Gardens,” http://mam.org/info/details/gardens.php, (accessed November 4, 2013). Project for Public Spaces. 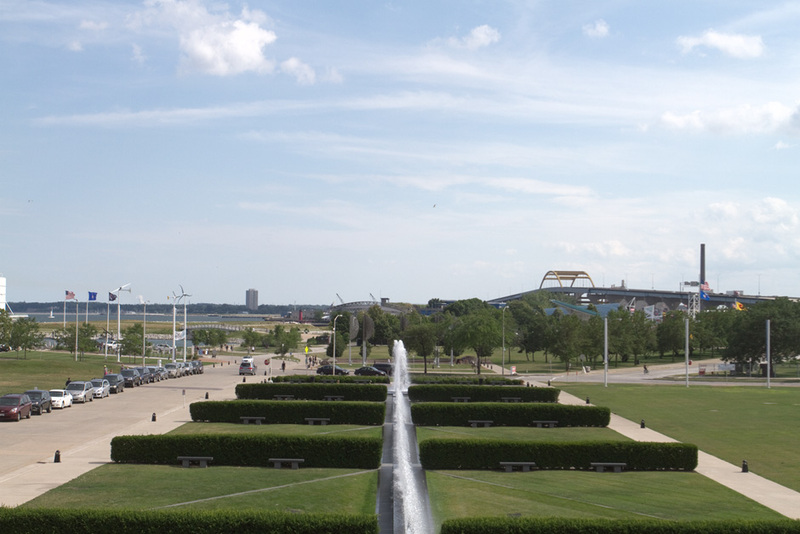 “Hall of Shame: Quadracci Pavilion and Cudahy Gardens, Milwaukee Art Museum,” http://www.pps.org/great_public_spaces/one?public_place_id=1004#. Arcspace. 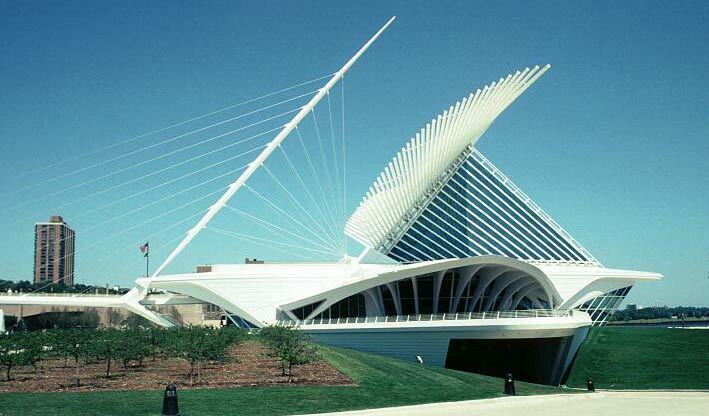 “The Milwaukee Art Museum,” http://www.arcspace.com/features/santiago-calatrava/the-milwaukee-art-museum/. Chicago – Architecture & Cityspace. “Milwaukee Art Museum: The Quadracci Pavilion,” http://chicago-architecture-jyoti.blogspot.com/2010/07/milwaukee-art-museum-quadracci-pavilion.html. Dillon, David, “Plain Geometry,” Landscape Architecture, March 2003, http://www.asla.org/lamag/lam03/march/feature1.html. Pudakone, Shambhavi R., “The Milwaukee Art Museum – Poetry in Motion,” Art Etc., January 2012, http://www.artnewsnviews.com/view-article.php?article=the-milwaukee-art-museum-poetry-in-motion&iid=29&articleid=825. The Cultural Landscape Foundation. 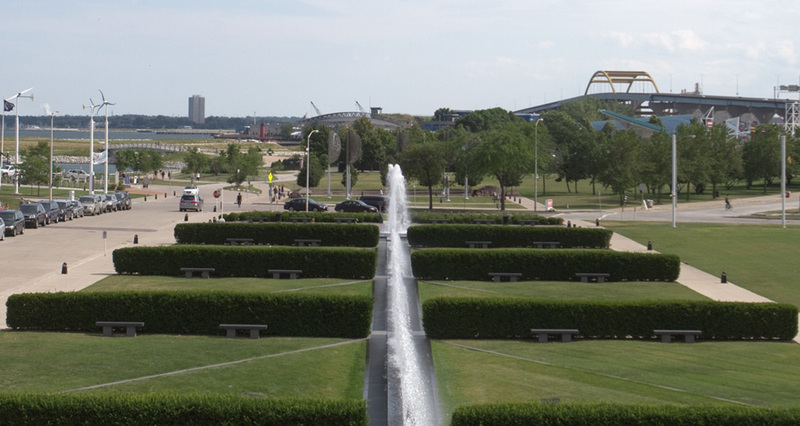 “What’s Out There: Milwaukee Art Museum, Cudahy Gardens,” https://tclf.org/landscapes/milwaukee-art-museum-cudahy-gardens, (accessed November 4, 2013). Plan courtesy Peter Morrow Meyer. It was a remarkable experience for me working with Dan and Santiago Calatrava, seeing how these two great minds interacted. I remember sitting in the elegant lobby of the Pfister Hotel in Milwaukee with Dan and Santiago, a big sketch pad out on the table, both of them communicating with fat pens on the paper getting more and more excited with each line drawn. While working as the curator of photography at the Milwaukee Art Museum, Bamberger produced more than thirty exhibitions and publications. Several noteworthy exhibitions introduced American audiences to Andreas Gursky, Anna and Bernhard Blume, and Rodney Graham. 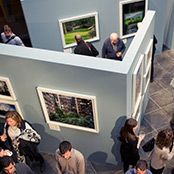 His own photographs have been exhibited at museums including the Museum of Modern Art, Art Institute of Chicago, San Francisco Museum of Modern Art, and the Museum of Fine Arts, Houston.